We all know the line, but what about the story behind it? Neil Armstrong was always keen on telling folks that he'd thought up the historical words after landing on the moon, but before the walk. That is to say, relatively off-the-cuff. A new documentary tells a slightly different story. Before he went to the Cape, he invited me down to spend a little time with him. He said "why don't you and I, once the boys go to bed, why don't we play a game of Risk." I said I'd enjoy that. We started playing Risk and then he slipped me a piece of paper and said "read that." I did. On that piece of paper there was "That's one small step for [a] man, one giant leap for mankind." He says "what do you think about that?" I said "fabulous." He said "I thought you might like that, but I wanted you to read it." 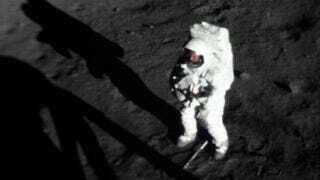 In the interview, Dean initially missed the "a" in "one small step for man" too, repeating the line as we've heard it so times. Neil had always insisted that he had said the "a" and it had just been lost in static, and Dean corrected himself just moments after the quote above, saying the "a" had been present in the note.